A daily tonic the give instant hydration and restores radiance. You skin is refreshed, balanced and soothed instantly. Possesses the antioxidant properties of Rose Absolute and Aloe Vera. A non-alcoholic toner and is very convenient to use. Tone the skin and remove any traces of dirt and oil after cleansing. They are hydrating to the skin replacing moisture lost to the sun and wind. It can be sprayed any time to refresh, uplift and rejuvenate. A feminine floral water consisting of 100 percent pure essential oils. 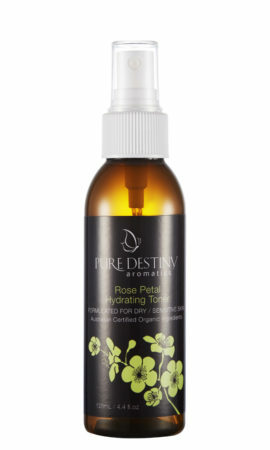 Perfect as a refreshing facial toner and to enhance healing and sensuality any time of the day. Dry / Sensitive Skin Type.